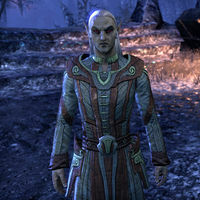 Gadris is a Dunmer mage who can be encountered near the Vile Laboratory, where he and Zur—a Khajiit alchemist— underwent cruel experiments at the hands of Daedra, which merged their souls and bodies. Both of them are looking for help to reverse it, before it kills them. Afterwards, he may be found in the Dark Alchemy Lab within the Hollow City. After following an orb of light, you can find a mage mumbling to himself as you approach. When you talk to him, the strangeness continues. "I'll handle this, Zur. You can come out and see in a moment. So, someone has come to help us at last!" "We're out here in the middle of Coldharbour and that's the best question you can come up with? I am most definitely not talking to myself. I am speaking to the alchemist. Be quiet, you mangy cat! I can't hear myself think with all that racket!" I don't see anyone else here. "Patience, Zur. I'll explain everything. I am with the Mages Guild. We stepped through the portal and wound up in this Vile Laboratory. Daedra experimented on us. They merged our two souls. Now we're wasting away as this soul-meld kills us." When you agree to help them, Gadris will abruptly turn into a Khajiit. After speaking with Zur and getting more details for your task, you can ask him if you can speak with Gadris again. Zur will comply. "You have no idea what it feels like to have a Khajiit scratching around inside your head." How did your notes and supplies get scattered? "I know you said you were sorry, but the question has been asked. One of us is disorganized and enjoys experimenting with Dwarven machinery. The resulting explosion reduced the entryway to a pile of rubble and sent our supplies in all directions." "Safe enough. We'll make our way to the entryway. We can manage a simple illusion to mask our presence. I wish we weren't so weak, however. I never realized …." "I never realized how my ability to perform magic defined me. Now that I cannot do the things that once came so easily to me, I almost don't know who I am. Having a talking cat inside my head doesn't help much, either." What happened to the other mages? "A few of us arrived together, but only the alchemist and I survived the experiments. Zur's explosion had one desirable side effect—it destroyed our Dremora captors. We have information vital to the Mages Guild, should we escape this predicament." After you have delivered the materials to Zur, he will make the Transmutation Potion. Zur: "Ah, Zur's finest potion yet! You will drink it now, yes?" Gadris: "This grows more taxing by the hour." You can then speak with Gadris to take the potion and to ask what you'll need to do once you get into the main part of the lab. "Here is the potion. I hope Zur didn't cut any corners. But knowing him, it probably tastes terrible." So this is the potion that will make me small? "Yes, Zur, I'll be sure to mention it. I am not a mixer of potions, and I don't want to debate the merits of alchemy with Zur again, but the cat knows what he's doing. Inside, look for my notebook. It lists what you need to craft the antipodal rods." "Rods that will reverse the soul-meld. Just find the components and craft the rods. We will try to recuperate and regain enough strength to teleport ourselves inside. If you have questions, please ask them before you drink the potion." I'll drink the potion now. "The potion will work. You'll see. And know that I am grateful for your help. We both are." Tell me what I need to do once I get inside. "Find the metallurgy workshop. My notebook should be there, placed neatly on a workbench. It contains a list of what you need to create the antipodal rods. Gather the items and craft the rods." I'm not sure I understand these antipodal rods. Zur reminds me that time is short, so I will try to be brief. The rods form two opposing forces that should create a negative energy vortex. In theory, the vortex will unlink the strands that bind our souls and set us free." You want me to forge something? "It shouldn't be a problem. The laboratory has a forge. Just follow the directions and apply the proper catalyst. The rods should be able to withstand the reversal process. After you forge the rods, meet me by the Overseer's atelier." Once you have drunk the potion you will be transformed into a monkey, you can attempt to talk to Gadris. "This is rather disconcerting. I don't believe I've ever had a conversation with a monkey before." "I assume you want to know more about what we need you to do. You are small enough now to squeeze through the rubble and run along the pipes. Be careful of the venting steam, however. We don't want your little monkey paws to get burned." "Once you get through the rubble, look for my notes. They list the components you need to find to craft the rods. Zur and I will meet you inside. We'll keep hidden as best we can. This damnable weakness is so annoying." After you taken the corrupted blood to be used as a catalyst for the forging, Gadris will be waiting near the door to the experiment chamber. He will be hiding due to the Dwemer constructs having reactivated. Gadris: "Over here! The constructs have moved away from the forge." When you speak with him, he will sound more tired than before. "All this skulking around, using up valuable energy on apprentice-level illusions. I grow ever more weary. Even Zur's enthusiasm is ebbing." I've got the corrupted blood. "I am afraid to hope too much, but you've made such progress. Perhaps we shall end this torment, after all. The constructs have moved off. The forge area is clear, at least for the moment." What do I need to do at the forge? "Melt the components in the furnace. Then craft two rods from the mixture. There is an anvil near the furnace. Be careful, though. The mixture can be volatile. The machine that merged us is further on, in the Overseer's atelier. We'll meet there." Once you have successfully forged the antipodal rods, Gadris will be waiting for you outside the atelier. "Teleportation was never this difficult before. The spell took so much out of me, I was afraid we would never materialize. But Zur has the key to this room. He acquired it shortly after we got here. Were you able to craft the antipodal rods?" I followed your directions. What will the rods do? "We are so close. You need to use the rods to activate the Dwarven device that performed the soul-meld. Oh, and the crystal! I am getting as careless as Zur. Look for a glowing crystal. The Overseer placed it in the machine to power the device." Place the crystal and insert the rods, got it. This will separate the two of you? "Ah, well, in a manner of speaking. Understand that Zur and I do not have two separate bodies to return to. But if this works, the soul-meld won't kill the both of us." "The magic will separate the intertwined strands of our souls, but only one of us will survive the process. Do not be dismayed. We rejoice at a chance for one of us to survive. Go on ahead. We will meet you inside momentarily." "Stop shouting, Zur! What? Oh. Yes, of course. No, you're right. Zur reminds me that you have been most helpful and we need to rest, anyway, so I decided not to cut you off with a snide retort. Please accept my apologies and ask your questions." Why does having the two souls weaken you so badly? "Based on our own experience, it appears that merging two souls into one vessal causes an internal storm as the souls vie for control. It takes all of our mental fortitude to maintain our individual personalities." What if we can't reverse the soul-meld? "Then nature takes its course. But at least we will have tried to beat this. At least one of us has a chance to survive. And know that however this ends, I am grateful for the aid you have provided us." Which one of you will survive the process? "If the device works the way I expect, then the person operating it will decide which of our souls survives the reversal process and which is … discarded. I guess it will be up to you to choose who lives and who dies." How do I choose which one of you to save? "Well, I could make a strong case as to why I should be the one to survive. My qualifications, my experience, my worth to the Mages Guild. But the truth is, I have grown fond of Zur. My right to survive is no greater than his. After you finish speaking with him, Zur will appear to say his own preemptive goodbyes. 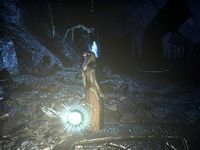 Once Overseer Xvarik is dead a you have retrieved the Meridia Crystal which powers the area, the Soul-Meld mage will appear. Gadris: "I wasn't sure the illusion would last long enough to make it across the chamber, but it did." Zur: "As the end approaches, this one must admit that he will miss our time together." They will then approach the machine. Once the rods are inserted, the souls will leave the body and you will have to pick which one to save. If you choose Gadris, he will be missing Zur. "I am grateful that you chose to save me. Still, I feel a bit lost. I wish … I wish Zur was still here." Did it work? Are you all right? "I'm not sure if I will ever be all right, but I live. I'm ashamed that I thought Zur was silly and scatterbrained. My time melded to him taught me so much. Zur had … a good soul." "I believe that the crystal powering the device is one of the fabled Lights of Meridia. Grab the crystal and meet me outside. You should be able to open the exit door. With my strength returning, I can teleport myself to a safe place." 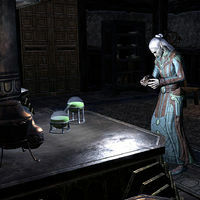 After you take the Light of Meridia and leave the laboratory, Gadris will be waiting for you below the balcony from which you emerge onto. "Thank you again for your help. For choosing me. But I wish that both Zur and I could have been saved." You mentioned information for the Mages Guild earlier. "During our time together, Zur and I determined that the Dwemer device has similarities to the method Molag Bal uses to perform the Planemeld. I will honor Zur's memory and give him credit for this discovery. Thank you again, friend, for saving us." Once you have completed the quest, Gadris will have enough power to create a portal. Gadris: "Now that my strength has returned, I can open a portal to the Hollow City." Gadris: "This portal will only remain open for a few minutes. I hope to see you again in the Hollow City." If Gadris was saved, he can be found in the Dark Alchemy Lab within the city. "It is nice to see you again, friend. I find the accommodations in this city to be most pleasing. I can't help but imagine that Zur would have taken great delight in this place. I think of him often." Gadris will attend the War Council in the Chapel of Light if he is in the city. "I wish that Zur were here. He would have been shaking in his fur at the thought of going up against Molag Bal, but he also appreciated a good council meeting." Gadris will be one of those assembled at the portal to the Labyrinth for the final push to Molag Bal's lair. "It feels good to be whole and strong again. You shall see my true power now that I've recovered from the soul-meld. I do miss Zur, though. He'd be beside himself at the thought of exploring a Daedric Prince's stronghold." After you have received your orders for the final assault, you can ask him about what he can do later on. "I see the time has come. We must climb this Endless Stair and pray we can stop the Planemeld. I hope this ends better than my soul-meld fiasco. I'd hate for either Nirn or Coldharbour to survive only to see the other destroyed. Just like poor Zur." What kind of help can you provide once we get inside? "I am a teacher and a theorist, but once I could hurl destructive spells with the best of them. With my strength restored, I look forward to showing Molag Bal what this old scholar can still do." So you'll fight in the initial assault? "Well, as much as I'd love to charge into the fray, someone needs to stand back and defend the less martial-oriented mages. But as soon as we make it to the dungeons, my services are yours if you need them." He can be met during the assault within the Labyrinth Library when he is part of Gabrielle Benele's team who is trying to unlock the gate to get further in. Gadris will be using a magelight as he peers down into the chasm. "There has to be a bottom. These rocks need to be anchored to something, don't they? Best stand back, though. I don't think either of us wants to find out what's down there that badly." After you unlock the gate he will admire the flame you used. "The power unleashed by that Daedric fire—astounding! Imagine the spells I could command if I could harness that energy." Gadris lights up the Dark Chamber. The next chamber will be unnaturally dark and Gadris will accompany you with his magelight. Gadris: "And darkness falls. This only gets better and better as we go along." You can talk to him to see if he can offer some assistance. "The darkness is obviously designed to hinder our progress. What an interesting conundrum." Can you help me get across the chamber? "I did mention I had a plan, didn't I? No? Well, I have a plan. I can provide a spell to light your way. It should help you navigate the chamber. I'll make sure the others follow … after we know it's safe, of course." He will give you your own magelight before sending you on your way. After you leave the chamber, the others will catch up, though Gadris will stay behind. This page was last modified on 7 March 2019, at 20:55.